» Do Labradors Shed? How Much Do Labs Shed? Few dogs are as popular as Labrador Retrievers are. But before you add one to your family, you must learn all you can about them and find the answers to any questions you may have. We’ll answer the question of how much Labs shed, when, and explain the finer points of Labrador shedding below. Like all other dogs, Labrador Retrievers shed. As individual hairs age, they become weak and brittle, so your dog’s body just lets them fall away. His body will then replace these lost hairs with new ones. Unfortunately for those of us who love the breed, Labs tend to shed rather heavily. This can cause problems for allergy sufferers, as well as those who simply prefer to keep a tidy home. However, there are a number of ways to help manage your Lab’s shedding, which we’ll discuss below. How Much Do Labs Shed? 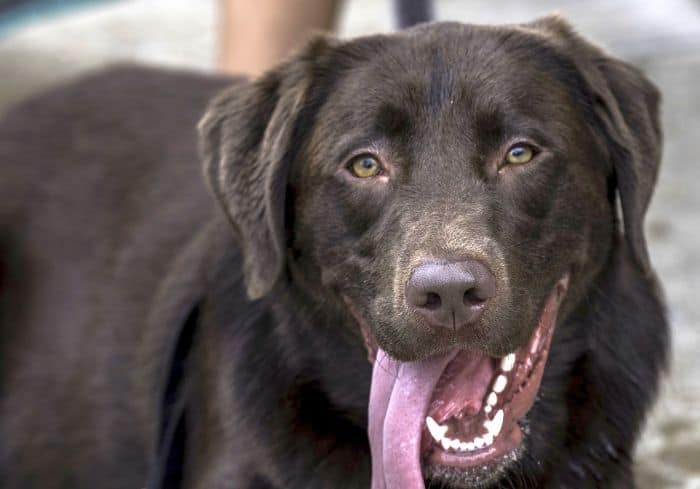 Do Labrador Retrievers Shed a Lot? It is difficult to compare the amount of hair various dog breeds shed, but most experienced dog owners would agree that Labs are fairly heavy shedders. They probably don’t shed quite as much as Huskies or Great Pyrenees do, but they will leave a coating of hair on your home and belongings. 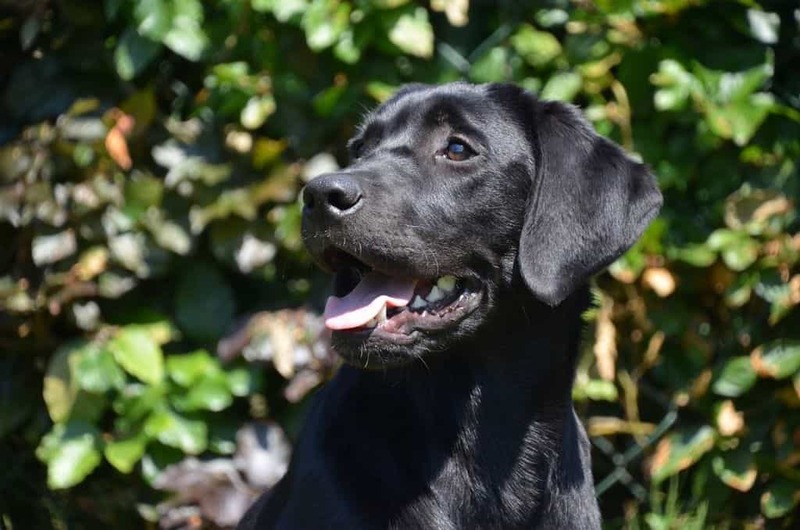 However, Labs have relatively short hair, which means you won’t notice a Lab’s shed hair as much as you would the hair shed by a Golden Retriever or other long-haired breed. Are There Any Non-Shedding Labrador Retrievers? Unfortunately, no — all Labs shed. A lot of people incorrectly characterize some dogs and breeds as non-shedding, this is simply not true. Even Labradoodles (mixed-breed dogs created by crossing a Poodle with a Labrador Retriever) shed. They typically don’t shed as much as a regular Lab does, but they will leave hair behind anywhere they go. When Do Labs Shed? Is There a Labrador Shedding Season? Labs shed small amounts of hairs constantly. Anytime you pet your Lab vigorously or brush him, you’ll end up knocking plenty of hairs off his body. But they also undergo a very heavy period of shedding twice each year — typically during the spring and fall, although the exact timing of the process can vary. Do Black (or Yellow or Chocolate) Labs Shed More than Others? 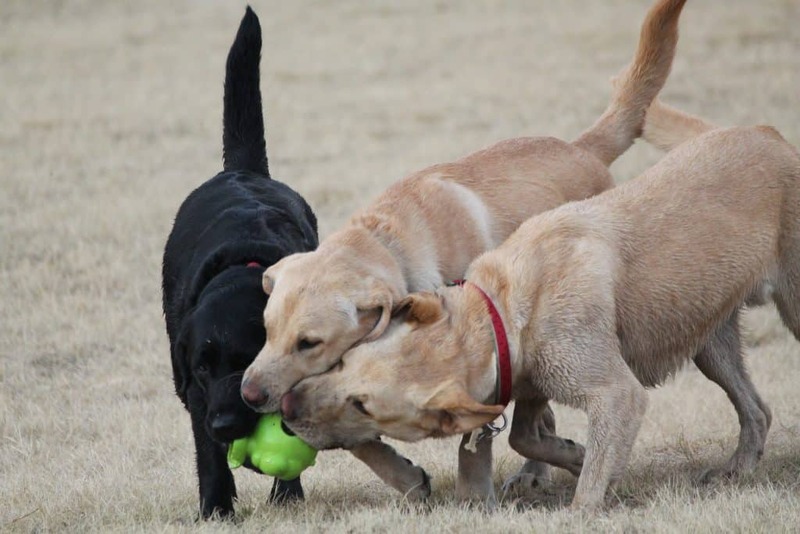 For the unaware, Labs come in three basic color varieties: black, yellow and chocolate. There is also the less common Silver Lab. This leads many potential owners to wonder whether any of the color varieties shed more or less than others. Unfortunately, the answer is no. All three types of Labs shed similar amounts of hair. However, depending on the color of your floors, furniture and carpets, some can appear to shed more than others. For example, if you have light-colored carpets in your home, a chocolate or black Lab will appear to shed more than a yellow Lab does, but this is just because the dark hairs are more obvious on a light-colored carpet. 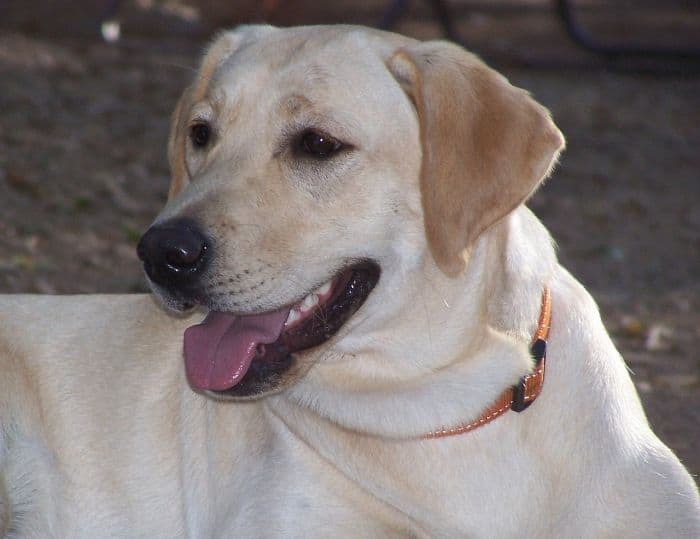 Labrador Retrievers were originally bred to help Canadian fishermen ply their craft. They’d jump in the water to fetch ropes and lines, as well as chase down fish flopping on the deck. And in order to excel at these tasks in the cold weather, Labs needed a really warm coat – so that’s exactly what the early breeders sought to develop. In fact, Labs not only have a single coat of hair, they actually have a thick double-coat. 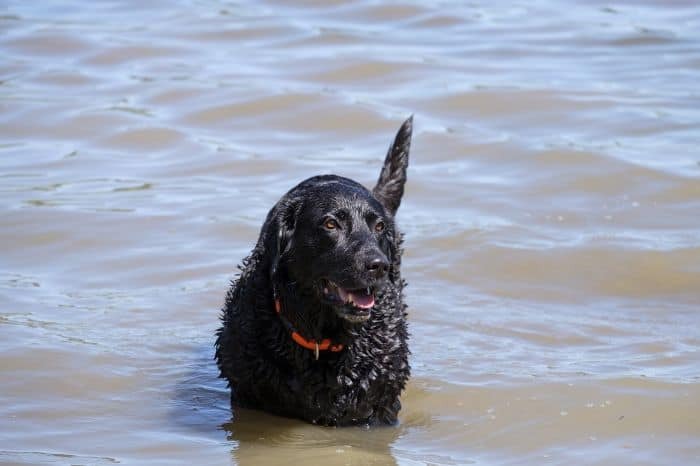 The outer layer of hair on Labs is comprised of waterproof hairs, which help to protect the dogs from the elements and keep their bodies relatively dry while swimming. Beneath their outer coats, Labs have a super-dense undercoat, which is comprised of short, thick, and soft hairs. This undercoat primarily helps to keep the dogs warm, even when their outer coat is wet and the cold winter winds are blowing. 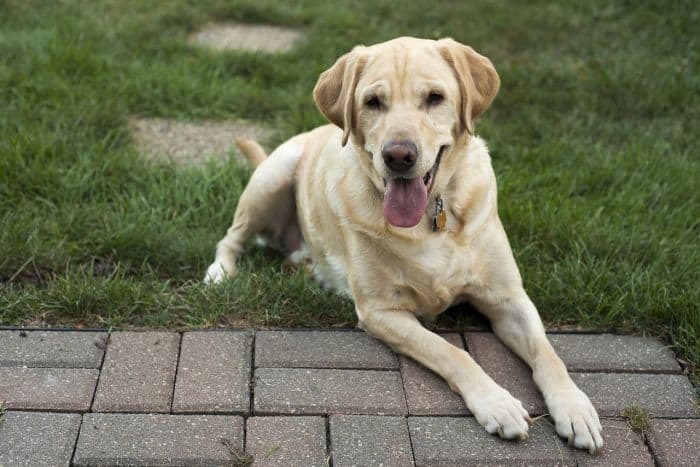 Labs may shed a lot of hair, but there are a few ways owners can help manage the situation. Just try to implement a few of the tips and tricks listed below to help limit the amount of fur coating your home. Feed your dog a high-quality food. High-quality foods will help keep your dog’s coat and skin healthy, which will ensure that he doesn’t shed excessive amounts of hair. Note that Labs are a big breed, so they need a food specifically designed for large dogs. We talk about some of the best dog foods for Labs. Be sure that your dog gets enough exercise. Sufficient exercise is a crucial component of dog care. Dogs who don’t receive enough exercise can not only struggle with obesity, but they can grow bored and frustrated over time. Additionally, by taking your dog to the park and playing fetch, you’ll not only make your dog healthier and happier, but you’ll also give him the chance to knock off some of his hair outdoors, instead of inside your home. Use a good preventative flea treatment. Fleas and other parasites can not only cause your dog to suffer from itchy skin, but they can lead to serious skin and coat problems, which may increase the amount of hair he sheds. Accordingly, you’ll want to use a good preventative flea treatment. Watch out for food allergies. 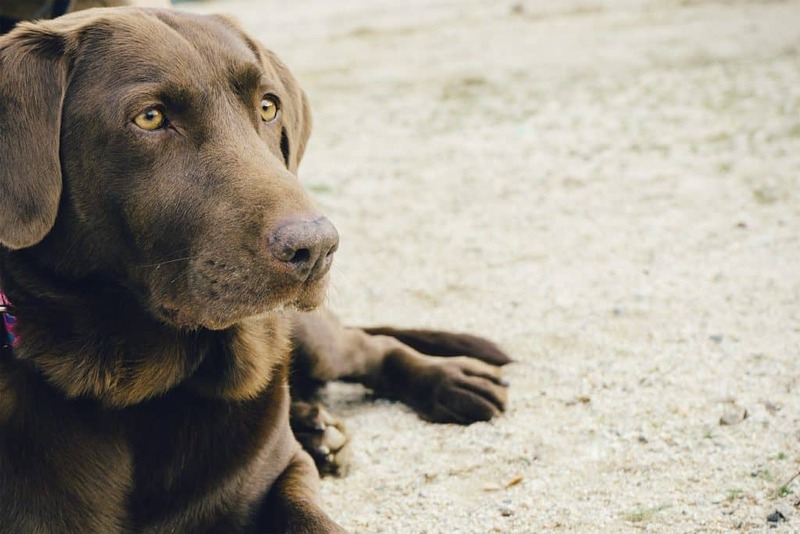 Food allergies are somewhat common in Labrador Retrievers, so you’ll want to be sure to observe your dog carefully for signs of itchy skin or poor coat luster. It’s important to work closely with your vet to help address food allergies properly, but you’ll likely want to switch his food to help put a stop to the problem. Fortunately, there are a number of limited-ingredient dog foods on the market, which can help you avoid feeding your dog a food containing an allergic trigger. Don’t neglect your dog’s mental health. Health isn’t only a physical issue – it is also important to keep your dog happy and properly stimulated to ensure he remains in good health. This means not only providing him with plenty of attention and exercise, but also giving him plenty of safe and durable toys. We review a few of the best chew toys for big dogs here. To help ensure that your dog’s skin and coat remain healthy, be sure to visit your vet regularly. Puppies will obviously need to visit the vet several times in their first few months of life to receive all of the necessary vaccinations, but adults should still go in for a yearly (and when possible, biannually) checkup. Your vet is more likely to notice the subtle signs that can indicate a skin or coat problem, which will help you start treatment before the issue becomes more severe. Labs do not require a lot of grooming – they’re pretty low-maintenance pets. However, if you just take the time to brush your Lab’s hair once or twice per week (particularly during the spring and summer when they shed most heavily), you can remove a lot of the soon-to-be shed hair in a controlled fashion. This will allow you to dispose of your dog’s hair properly, which will keep it from coating your couch, carpets and clothing. There are a number of brushes that will work, but a slicker- or pin-style brush is probably the best dog brush for Lab owners. We like the Hertzko Self-Cleaning Slicker Brush, as it features flexible pins that won’t irritate your dog’s skin and an ergonomic handle to make it comfortable in your hand. But the most notable feature of the Hertzko Brush is its self-cleaning mechanism, which makes removing the hair trapped in the brush’s pins quick and easy. Omega-3 fatty acids are important for your dog’s health in a variety of ways. Among other things, omega-3 fatty acids help to promote good coat and skin health, and they also help to reduce inflammation. These benefits will help to prevent your dog from suffering from skin ailments or shedding more than he should. Some of the very best large breed dog foods on the market are already fortified with omega-3-rich ingredients, but you can also purchase stand-alone fish oils for dogs. Some come in tablet form and can be given to your dog as a treat, but others are liquids that are designed to be sprayed on your dog’s food. Most omega-3 supplements (also called fish oil supplements, as they’re often made from salmon oil) are affordable, and dogs usually love the way they taste. Check out our guide to the best fish oils for dogs. Regular baths will not only keep your pup looking and smelling his best, but they’ll also help to prevent fungi, bacteria and other pathogens from clinging to his skin and hair. Additionally, regular baths will help wash a lot of the hair off your dog’s body, where it’ll collect in the water below. This will prevent the hair from ending up in the rest of your home. Be careful not to bathe your dog too frequently, as this can actually exacerbate shedding problems. Most dogs can be bathed once a month or so, but refrain from doing so more often than this. Also, be sure that you use a shampoo that is specifically designed to support the skin and coat health of dogs. As long as the weather is warm, you can bathe your dog outdoors. But you’ll need to be sure to head inside and bathe your dog in the bathtub when the temperatures are under 70 degrees or so. Most owners should take their Lab swimming as often as possible. Labs have high energy levels, and swimming is a great way to let them exercise. Also, most Labs absolutely love playing in the water, so it’s good for their mental health too. But swimming also provides you with a great way to deal with your Lab’s hair. During a half-hour swim session, the water will loosen and remove a lot of the hair your dog will be shedding soon. But instead of this hair ending up on your kitchen and living room floor, the hair will stay behind in the lake, river or ocean your dog was enjoying. You can also let your Labrador Retriever swim in your swimming pool, just be sure to clean the pool filters afterward so you can remove the hair that collects on them. No matter what you do to help reduce the amount of hair your dog sheds, there’s simply no way to eliminate the problem completely. Your Lab will shed fur, and it will get on your furniture, floors and other belongings. So, you’ll need to spend a bit of time cleaning up every week to keep your home neat and tidy. 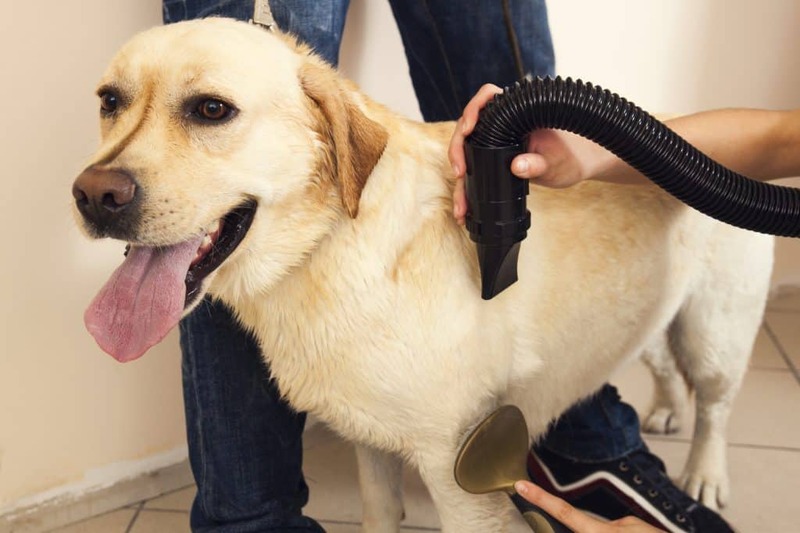 A vacuum is the easiest way to clean up shed dog hair – trying to sweep your floors will only push the hair around and cause much of it to float up into the air, where it’ll just land on other surfaces. However, a regular vacuum won’t last very long if you use it to clean up after your dog on a regular basis. Instead, you need a vacuum specifically designed to deal with pet hair. The Dyson DC41 Animal is a great choice. It uses radial root cyclone technology to produce very powerful suction, and it features ball-steering technology, which makes it easy to pilot the vacuum around your home and get under tables and other objects that can trap hair. It even comes with a 5-year warranty, so you can purchase with confidence. The Dyson DC41 is definitely not a cheap vacuum, but you’ll likely save money on it over the long-term, as it’ll hold up to dog hair better than typical vacuums. This means you won’t have to replace it every year or two, like you would most other vacuums used to clean up after a Labrador Retriever. As you can see, there are a number of ways you can help reduce the amount of hair your Lab spreads around your home. Remember that most of the tips presented above can be employed simultaneously and doing so will allow you to enjoy better results than if you only implement a single strategy. Have you found a particularly helpful way to manage your Lab’s shedding? Tell us all about it in the comments below. Labrador vs Golden Retriever: Which Breed is Best For You?